U.S. Rep. Jackie Speier, D-Calif., talks to reporters after a news conference on investigating President Donald Trump for sexual misconduct, on Capitol Hill in Washington, Dec. 12, 2017. Female lawmakers in Washington are calling on colleagues to wear all black to President Donald Trump’s State of Union address at the end of the month — on behalf of victims of sexual harassment. U.S. Rep. Jackie Speier, D-Calif., said she is spearheading the protest to keep momentum going following last Sunday’s all-black-attire protest at the Golden Globe awards ceremony. 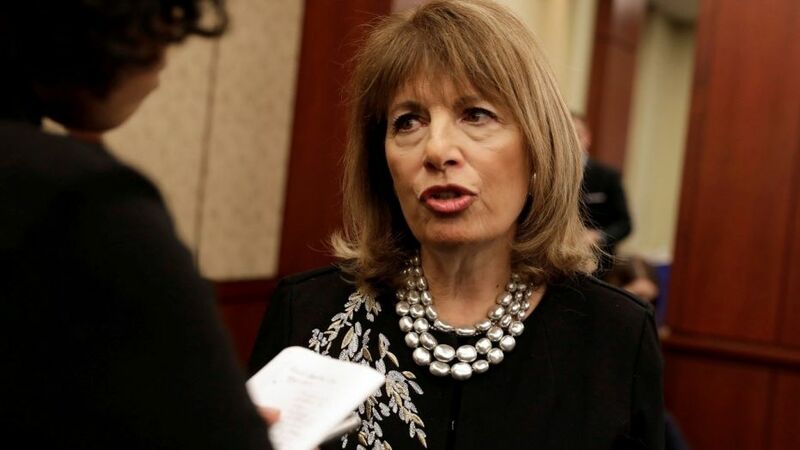 “This is a culture change that is sweeping the country and Congress is embracing it,” Speier said in a statement, the Washington Post reported. Speier invited both Democrats and Republicans, as well as women and men, to join the demonstration at Trump’s speech on Capitol Hill on Jan. 30. In November, Speier and U.S. Sen. Kirsten Gillibrand, D-N.Y., introduced the #MeTooCongress Act to strengthen victim’s rights and increase accountability for offenders, the Post reported. In recent months, at least seven male lawmakers in Washington have faced allegations of sexual harassment or other misconduct, the newspaper reported. All have either resigned or opted not to seek reelection. In December, Trump sharply responded when Gillibrand called on him to resign over the accusations. “Lightweight Senator Kirsten Gillibrand, a total flunky for Chuck Schumer and someone who would come to my office ‘begging’ for campaign contributions not so long ago (and would do anything for them), is now in the ring fighting against Trump. Very disloyal to Bill & Crooked-USED!” Trump tweeted. On Dec. 31, the New York Times reported that Hillary Clinton friend Susie Tompkins Buell paid $500,000 in an unsuccessful effort to fund women willing to accuse Trump of sexual misconduct before the 2016 election. Earlier in the month, the Hill reported that attorney Lisa Bloom tried to line up big paydays for women who were willing to accuse Trump of sexual misconduct during the final months of the election.